Paper; Global Warming "The Biggest Science Scandal Ever"
Thread: Paper; Global Warming "The Biggest Science Scandal Ever"
Re: Paper; Global Warming "The Biggest Science Scandal Ever"
That's like saying "the rulers of the world convinced most of the populace that insects spontaneously emerged from rotting food and persecuted anyone who dared to question it in order to maintain control over the populace". I'd like to note for the record that I welcome our new insect overlords. Lily (age 6): Daddy, I know what I want to be when I grow up: an artist. Bodhi (internally groaning): Yeah? What kind of artist? Lily: A balloon animal artist! I just have to point out that the bolded above is one of the most bogus myths in history. For one, medieval people did not all believe the world was flat. For two, how would this help you control the world? I bolded the same portion for some odd reason. Chris Booker, huh? Tells me all I needed to know. I guess you're right. I won't believe it until I hear it from Brian Williams. 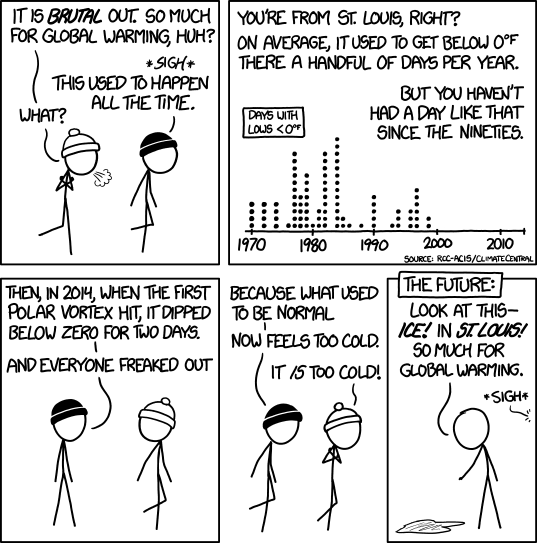 In all seriousness, though, for this somewhat-conservative, it's not whether global warming/climate change is real vs hoax, but whether government is a solution or a power grab. What is the proposed solution? What will it cost? How certain can we be that it would work? Committing economic suicide today to (maybe) prevent climate disasters 10, 20, 50, or 90 years down the line doesn't seem wise, IMO. Do you ever find it interesting that liberals have bought into climate change hook line and sinker, while conservatives overwhelmingly dismiss the entire thing as a hoax? I'm pretty conservative but I trust the scientific community much more than the government. Without either, I would suspect something just from the changes in weather where I live in my lifetime. This is my issue. Before we force companies and our society to spend untold billions of dollars. How sure are we they're even going to work? Or is it just a guess? The existence of God isn't determined in the thoughts of man. God exists, no matter what man thinks. "It cost a lot of money to look this cheap. "-Dolly Parton. Al Gore recently said $90 Trillion should help eliminate greenhouse gases and cars. Does the planet even have $90 Trillion? As for the scientific community as it relates to Climate Change, they are the government. So to continue their funding, of course they're going to perpetuate the fraud. I guess that I'm really conservative! I don't trust either one. Yes, I've also noticed that sometimes it's hot and sometimes it's cold and sometimes it's mild. Sometimes, it rains, sometimes it snows. I've seen hail as a child, as a teenager, as a middle aged person, and as an old man. It has always been that way in seven decades of my life. We had tornadoes when I was a child and we've had tornadoes while I've been an old man and some even in-between. I guess that I just haven't noticed a difference. Let's see, is anyone profiting from the Global Warming controversy. Since the Ice Age, that ICE has been melting. It was doing so big time even prior to the Industrial Revolution. Last edited by Al A Bama; February 9th, 2015 at 01:39 PM. I wouldn't know, don't really watch NBC Nightly News. The only news show I watch routinely is CBS Sunday Morning News. I wish I had the answers to those questions, but I don't. I do think the only entity capable of imposing the necessary regulation is government. As an example, CFCs. What we really need is an energy breakthrough. There's not going to be much impetus to change what we're doing as long as fossil fuels are the best we have for energy production. Hopefully Lockheed-Martin's supposed breakthrough on nuclear fusion isn't just a pipe dream. That would be just the kind of game changer we would need. Last edited by AUDub; February 9th, 2015 at 02:10 PM. I also don't trust either. That said, the appearance of certain species in higher numbers around where I live makes me believe something is happening. There are just too many vested interests further vesting themselves. It is just as well known and proven that data has been doctored as it is that the climate changes. I need to print out the climate change bingo card. We might hit every trope here. Right now there's more money to be made in the denialist camp. Just ask Fred Singer. Last edited by AUDub; February 9th, 2015 at 02:04 PM. Reason: grammar. Stupid iPad. I don't trust the government at all. The scientists have less of an agenda. I have a B of S from Bama. I had a project on strip mine reclamation my senior year. It was the hot topic of the day and I found out first hand it strip mining was very bad environmentally. There are good doctors and bad and some are in it for the money only. A global conspiracy of global warming would be too easy to expose IMO. When I was a child it snowed 2-3 times a year, 4-8 inches. Rarely does that happen any more. Southern Kentucky seems to now have the same weather that southern Tennessee used to have (not scientific at all).